Are You Ready For The First Big Party Of 2018? You are invited to the first biggest and best party of 2018. The fifth annual 80s Throwback Party to benefit Brighton Center Recovery Center for Women will be Saturday, February 3rd from 8 p.m to 1 a.m. at the Highland Country Club. 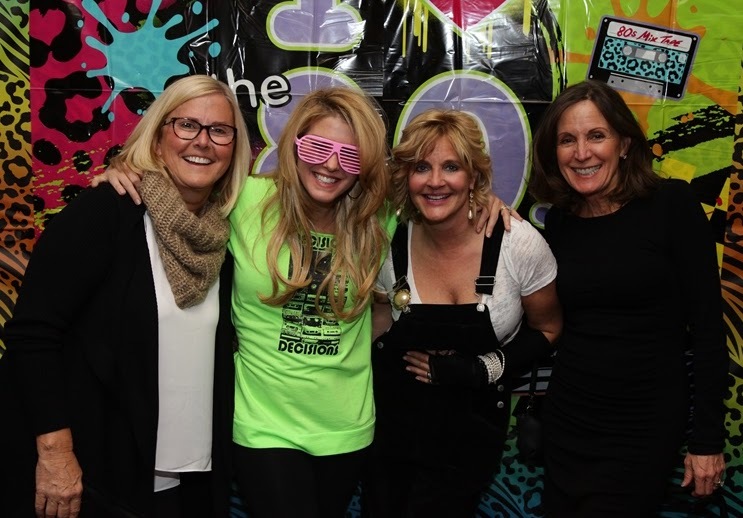 Katie Walters of Q102 and co-host of the event, alongside Fort Thomas Matters' Mark Collier, said, "Not only are more facilities and beds needed, the current ones need constant support to keep up with the demand. When I started this party five years ago, I never thought the epidemic would be worse five years later, but it is. LISTEN: What Franchise Restaurants Could be Coming to Cold Spring? 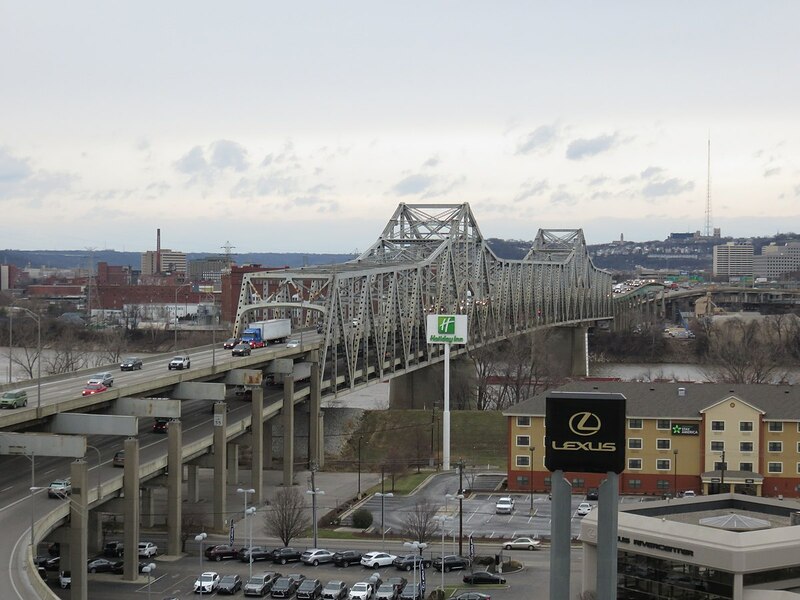 What's trending in economic development and how are those trends affecting northern Kentucky? What restaurants have expressed an interest in locating here in Campbell County? FTM's Mark Collier breaks it down with county insider and attorney, Brandon Voelker. Barre3 Ft. Thomas. This is an advertisement. 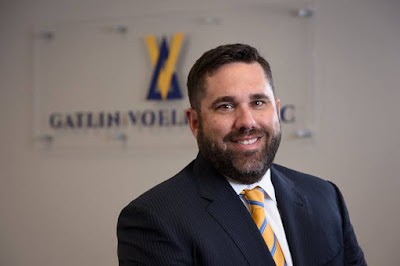 You can reach Voelker at 859-781-9100, on his website or Facebook page. Contributed Photo. 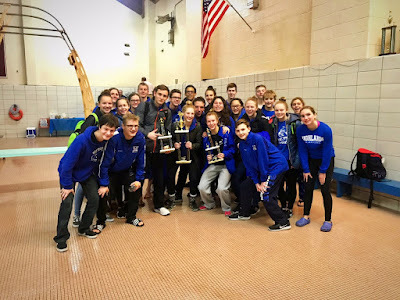 The Highlands Swimming and Diving Teams hold up all three trophies from the Eastern Kentucky Relay Meet on Dec. 9. The Highlands teams have won both meets so far this season. The Highlands Swimming and Diving Teams jumped off to a quick start and would like to earn more big wins in the coming months. The Highlands swim teams captured all three titles at the 15-team Eastern Kentucky University Relay Meet on Dec. 9. The Highlands boys scored 296 beating second-place Scott County by six points and the girls scored 294 beating runner-up Sacred Heart by 52 points. Highlands scored a Combined 624 points. Runner-up Scott County scored 564. Looking for a way to entertain the family over the holiday break? 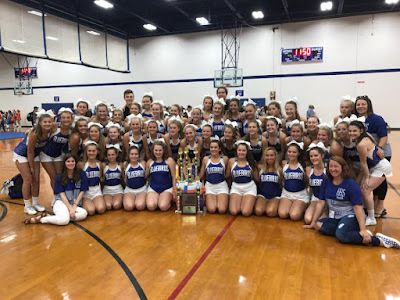 Join the Highlands Cheerleading squad for good food, good music and good fun this Friday, December 29th from 7 p.m. to 9 p.m. in the Highlands Middle School Gym. The cost is $10 individual or $25 family, which will help fund the team's first ever trip to the national cheerleading completion in Orlando. City Council welcomed back new Fort Thomas Police Officer Kalin Holland and his son,Titus. 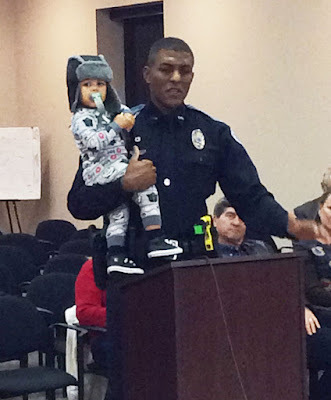 The city of Fort Thomas last saw new Police Officer Kalin Holland in June before he left for the Police Academy. Now he has returned, and he addressed council to talk briefly about his experience. "It is great to see you all again," said Officer Holland. "It’s been a long journey. I’m glad to be back here in the city and learning its streets." He said the academy gave him good preparation for his work ahead. In the classroom, he studied legal issues, but also how to handle hazardous materials and de-escalation tactics for tense situations. He had physical training three days a week as well as training in firearms, defensive tactics and driving skills. The class practiced a wide variety of scenarios and role plays so officers could build confidence and familiarity with a wide variety of situations. Holland, who was number one in his academy class, said he felt he received top class training at the academy, and he praised his training officers and the program. Mayor Eric Haas welcomed Officer Holland back to the city and said he is looking forward to working with him. In other news, two promotions were signed in by executive order. Chris Carpenter was promoted to Lieutenant and Adam Noe was promoted to Sargent. Street repaving. Photo by Glenn Beltz via Creative Commons. Speaking for the city Public Works Committee, Chair Ken Bowman shared recommendations for the 2018 capital improvement budget at the December city council meeting. The budget includes funds for streets selected for improvements in the coming year. Reading from a statement by the committee, Bowman said, "The 2018 street improvement program includes the following streets: Pentland Place, Sabre Court and David Drive. 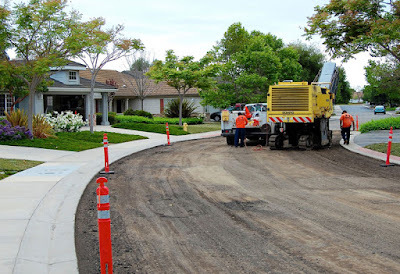 The plan calls for complete removal and construction of these streets, gutters, storm sewer inlets and replacement of granular subgrade with trenches draining under the new pavement." There are two ways to get rid of your Christmas tree now that the big day has passed. The Kentucky Department of Fish and Wildlife Resources has a solution for people wanting to get rid of their natural Christmas trees after the holidays. The agency says instead of putting it on the street or just leaving it in the backyard until spring, donate the tree to be used for fish habitat. Need a website? Call 859-628-2481. Fisheries Director Ron Brooks says the agency tries to get numerous trees every year to sink them for the fish. There are drop-off points across the state. They will take your tree and combine it with others to create fish attractors for lakes all over the state. "These brush reefs provide nesting and rearing habitat for gamefish as well as creating homes for invertebrates and smaller fishes that provide food for larger fish. Just clean your tree of all of the artificial decorations, lights, tinsel, ornaments and drop it off at one of our locations," the department said in a release. The state will accept them until January 15. The closest drop-off in northern Kentucky is in Grant County's Boltz Lake Boat Ramp, near Florence. From I-75 Exit 159 take Highway 22 west to Highway 467 north, located off of Mount Zion Road. In Campbell County, Northern Kentucky University will chip all undecorated trees to use around county and city parks throughout the county. barre3 Fort Thomas is an independently owned exercise studio located in Fort Thomas Plaza where balance, support, strength, and friendship are guiding principles. 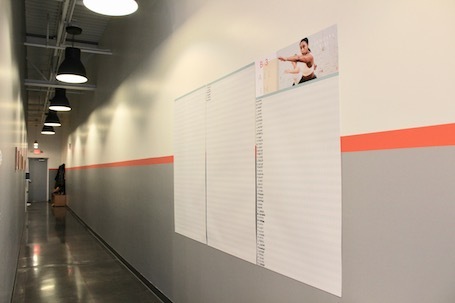 A rewarding workout is just the beginning of what barre3 offers. A culture of support and friendship is cultivated by the instructors and the design of the space encourages relaxation and simplicity. 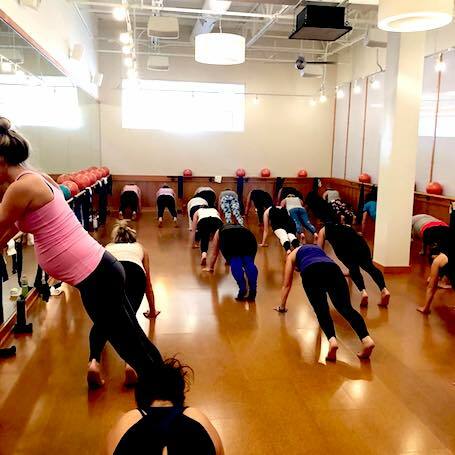 Owner of barre3 Fort Thomas, Bianca Lauck began as a client at a barre3 studio and fell in love with the workout and community spirit that developed between instructors and clients. 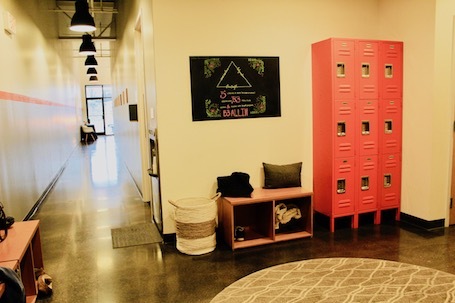 For Bianca, owning a studio wasn’t just a chance to have her own business, but a chance to offer other people what she had found in barre3: incredible workouts, a like-minded, inclusive community, and a respite from the demands of everyday life. 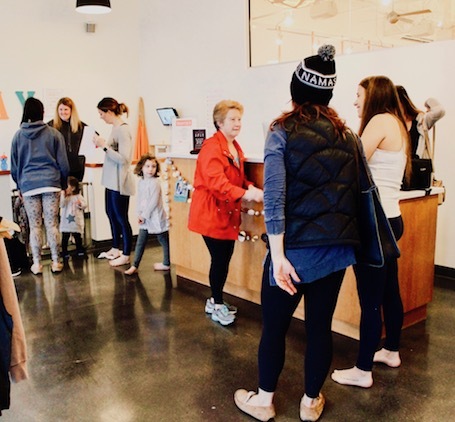 Each barre3 studio is a reflection of the community to which it belongs. 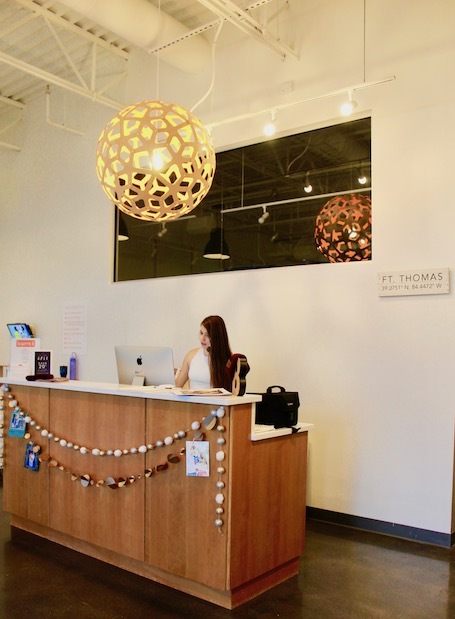 barre3 Fort Thomas is a gathering place where members come for a break from daily demands and are able to connect with others, leaving refreshed and renewed. Every barre3 class works strategically to build strength and flexibility for optimal body balance and improved posture. Your barre3 practice will give you proportion in the body that is shapely and attractive. But body balance is more than losing weight and building muscle tone. When we stand tall with ease, a positive chain of benefits happens beyond what we see in the mirror. 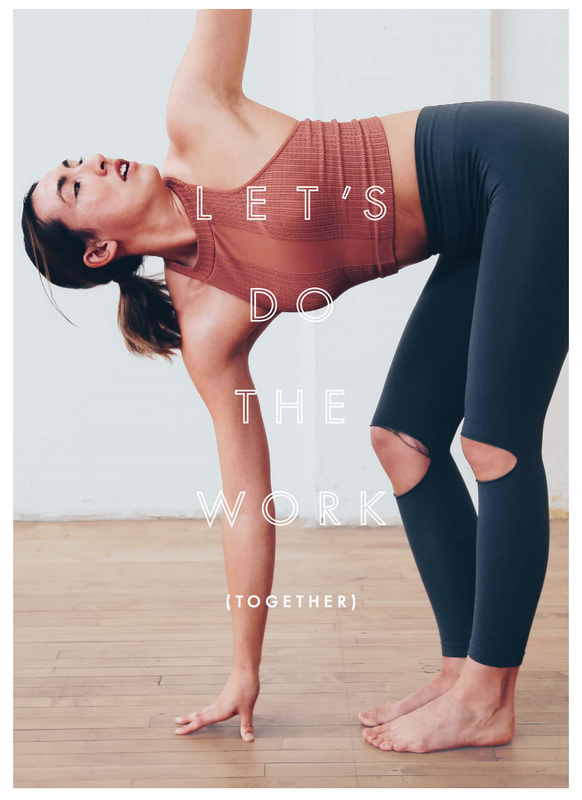 With body balance comes improved digestion, increased energy, minimized risk of injury, a clear mind, and a healthier and happier way of life. 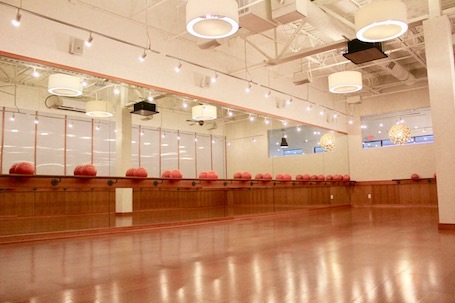 Jessica Donelan and manager Megan Groneck are two of the seven instructors you'll meet at barre3 Fort Thomas. Annie Schneider and Abbie Finnegan work the front desk and the children's Play Lounge. Kara Schneider is a regular and has a warm generous smile. 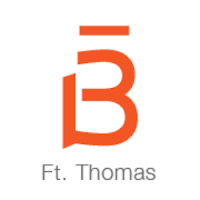 barre3 Fort Thomas is a generous blend of vibrance, serenity and simplicity. An abundance of natural light streams in through the main entrance creating a light, airy reception area that flows to the cozy lounge area whose walls are lined with small lockers and comfortable benches. The color palette is a subtle range of grays from mist to slate to charcoal with lots of white and lively orange accents. "For me, it's contagious. When you finish a class the positivity from our clients make me happy. I am truly blessed to have a job where I can be with these amazing people. I didn't workout before barre3. It's truly amazing to find a workout you want to do everyday and can do everyday. It's truly for everyone". I spoke to several members after the 8:30am class who were so enthusiastic about the classes as well as the holistic body-mind approach to health. I spoke with a woman named Sheri who has been a part of barre3 Fort Thomas since its beginnings, she said, "It's a full body workout that always different, always challenging. It doesn't get boring". 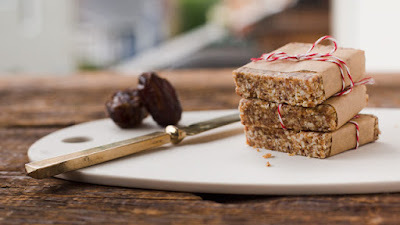 When I asked about her favorite barre3 recipe she recommended the BARRE3 ENERGY BARS - you can find the recipe here. Katy Leftin helps out in the children's Play Lounge and is passionate about barre3. "It's nice seeing familiar faces. It's a great workout both physically and mentally. I've met so many people - it's been awesome. The people here are like a second family". 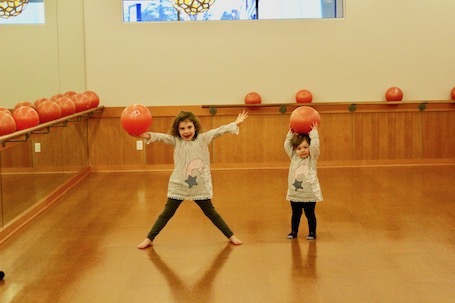 The sense of family at barre3 Fort Thomas extends to the children of members and instructors. 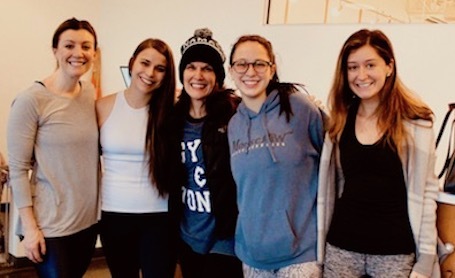 Instructor Megan Groneck said it's been wonderful for her children to grow up with the children of the other instructors and members in the close-knit community. 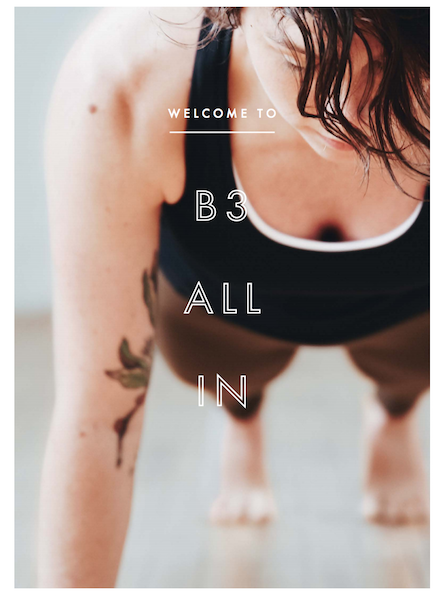 B3 ALL IN is barre3's month long retreat-like program designed to make the journey to healthy rewarding, lasting and simple - it's the perfect way to start the new year. 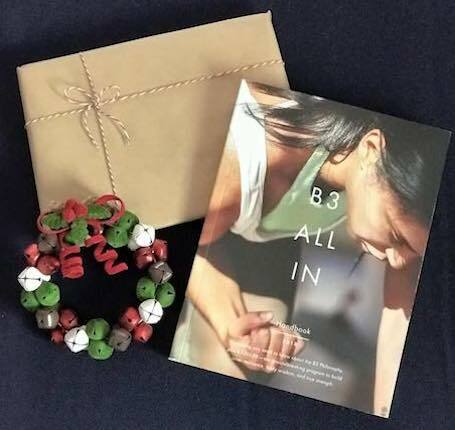 B3 ALL IN was designed by a team of Master Trainers and Certified Health Coaches to strengthen, tone and lengthen the body, soothe the mind and nourish the body. 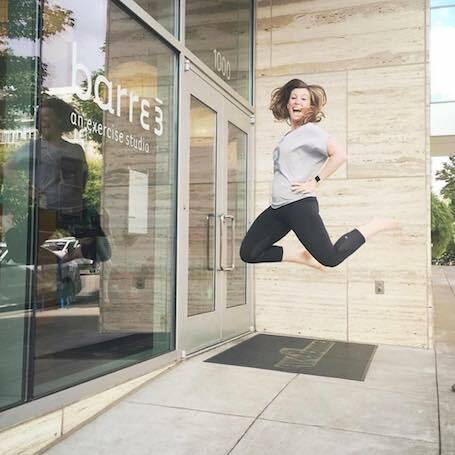 No contract and no commitment means it's a perfect way to experience barre3 and see if it's right for you. "Find the joy. There’s nothing like a rigid goal to take the fun out of exercise. When I told myself that I had to work out for a certain amount of time every day, it felt like a chore. But when I realized that, for me, the joy in exercise comes from connecting with myself and the people around me, suddenly I began to crave it. Try letting go of the numbers and focusing on moving in a way that brings you joy instead". Have small children? 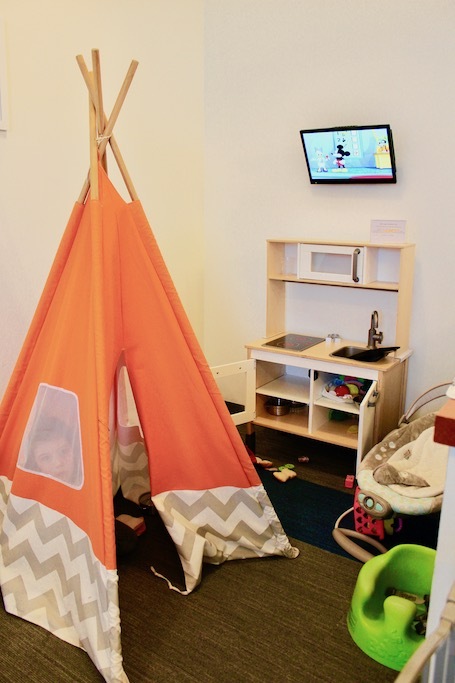 Bring them with you and let them explore the Play Lounge, a happy little space with a caring adult while you workout and connect. Play Lounge is always free and available for members for the 8:30am, 9:45am and 4:45pm classes. Kick off the new year with positive, healthy choices. Let barre3 take the guess work out of staying motivated, energized and eating clean. Show up with a willingness to get moving and a bottle of water - they'll handle the rest! Move. Nourish. Connect. See what it's all about January 1st. Remember to take it slow in the snow! Looks like there could be a white Christmas Eve. 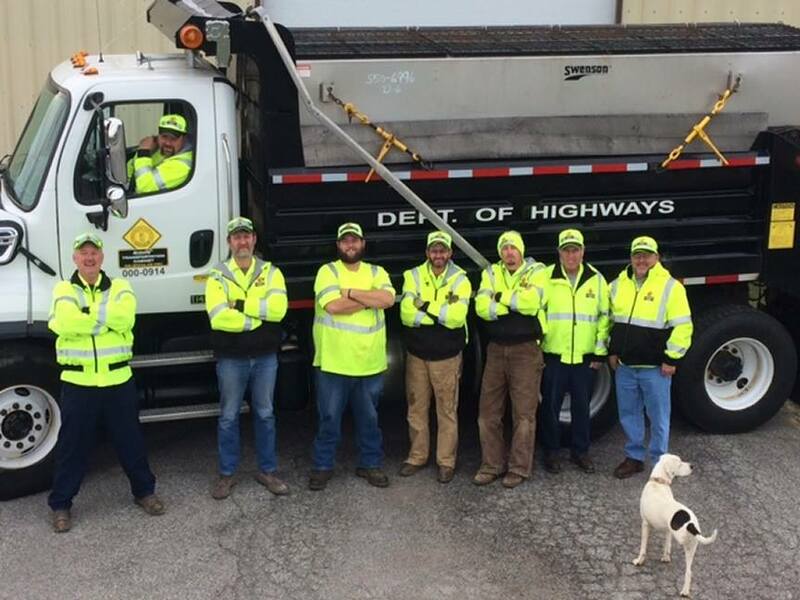 The Kentucky Transportation Cabinet District 6 snow and ice removal crews will be reporting in starting at 1 p.m. today. The latest forecast says that a rain-snow mix can start this afternoon around 3. The forecasters are calling for the potential of 1-2 inches. District 6 Snowfighters had the trucks loaded with salt on Friday in anticipation for the Christmas Eve forecast. Crews will be mobilized ahead of the snowfall and they will remain on duty until roads are in the best possible condition. Always be mindful of the potential for slick spots on roadways, especially overpasses and bridges is possible. Remember to take it slow in the snow! Anti-icing agents that we use (salt, brine and calcium chloride) are agents to assist in treating roadways during winter snow and ice events. They can only do so much. Other variables such as pavement temperature, air temperature, intensity of the storm and timing of the storm also factor in. The Kentucky Transportation Cabinet (KYTC) has a webpage just for snow and ice information. Know before you go! The public can visit http://snowky.ky.gov to learn more about priority routes, access helpful winter weather tips and fact sheets and view informational videos on salt application and snow removal. Every snow storm is different and presents unique challenges, such as air temperature, pavement temperature, timing of snowfall and ice. Last year District 6 crews used 10,307 tons of salt, approximately 131,031 gallons of salt brine and 15,281 gallons of liquid chloride for snow and ice events. In all, District 6 spent $4.2 million on equipment, materials and labor. The Buddy LaRosa High School Sports Hall of Fame announced its 2017 class Friday and for the first time ever, two high school teams. Six individuals were named, including Highlands alum Gino Guidugli (2001). He is the eighth Highlands alumni to be named to the LaRosas's Hall of Fame, joining Scott Draud, Owen Hauck (Coach), Homer Rice (Coach), Ken Shields (Coach), Derek Smith, Jaime Walz Richey and Jared Lorenzen. Guidugli holds many individual records at Highlands, including Passing Yards (Season), Touchdown Passes (Season), Touchdown Passes (Game) and Pass Completions (Season). Call Andrew to build your website from start to finish. 859-628-2481. He originally committed to UK out of Highlands, following the footsteps of former teammate Jared Lorenzen. However, when Hal Mumme was dismissed, the University of Cincinnati jumped in and coaxed over the river and up the hill. Guidugli went on to a UC Hall of Fame career and has his No. 7 posted at Nippert Stadium with other Bearcat legends. He his UC's all-time leader in passing yards (11,453), completions (880), touchdown passes (78) and holds the single-season passing yard title (3,543). He was team MVP twice, led UC to three bowl games and was MVP of the 2004 Fort Worth Bowl. 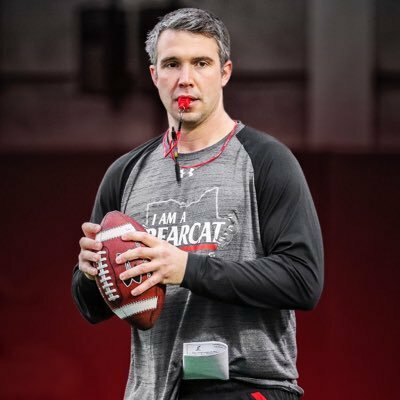 Guidugli is currently UC's running backs coach under head coach Luke Fickell. This week a study commissioned by the Commonwealth of Kentucky took a fresh look at the Brent Spence Bridge corridor and possible alternatives. The study confirmed a new bridge is needed, something Chambers of Commerce, on both sides of the river, have been advocating for over 15 years now. With the conclusion of this most recent study, we now have had multiple transportation officials, spanning different administrations, at both the state and federal levels, analyze this issue from every angle. Using data and facts, the debate about whether we need a new bridge is over. Now is the time to finally work toward finding a way to make it happen. Polling results for eligible voters in Northern Kentucky concluded the vast majority believe we need a new Brent Spence Bridge corridor. Most believe we should have started construction already. We can see first-hand the impact of not having an expanded I-75/71 corridor has had on our daily lives. Over 100 years ago, a cold December night in 1914 started off like many other nights. At that time, World War I, which would eventually claim over 16 million lives, was still in its early stages. With the use of machine guns, poisonous gases, tanks, airplanes, and many other new inventions of modern warfare, the “war to end all wars” was quickly becoming one of the most gruesome and deadliest. Yet on Christmas Eve, of that year an amazing thing happened, and the sound of gunfire, explosions, and screams were replaced with Christmas carols coming from the trenches. This event has come to be known as the Christmas Truce of 1914 and, in addition to the caroling, it consisted of soldiers exchanging food, souvenirs, and even playing friendly games of soccer. Time magazine referred to this Christmas Truce as “a testament to the power of hope and humanity in a truly dark hour of history,” and some reports estimate that 100,000 soldiers participated. As we approach Christmas over a century after this event, we can still benefit from its lesson. It seems lately that at every level (local, state, and federal), politics has gotten more divided. It is hard to get on social media and not see personal attacks and name-calling occur as a result of anything prominent politicians say or do. 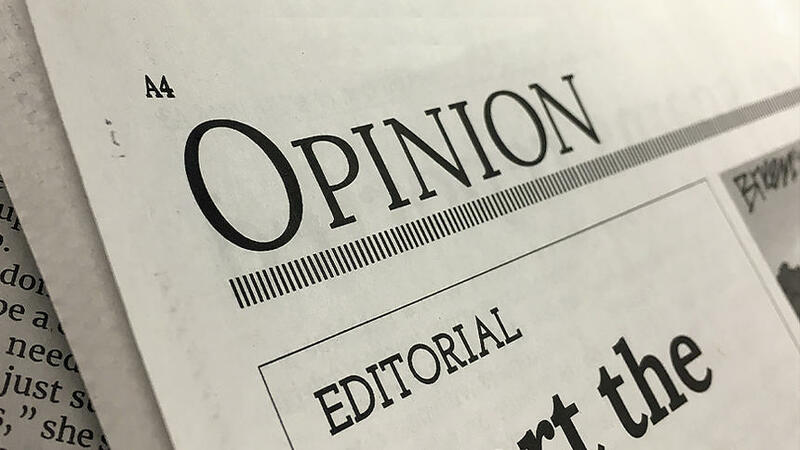 Instead of looking for common ground or remembering our state’s motto, “United We Stand, Divided We Fall,” it sometimes seems that all attention has been on tearing down the other side. These efforts are often not because of policy reasons, but because of party affiliation. 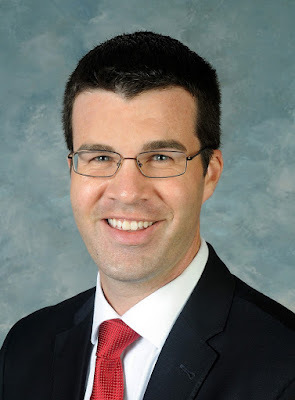 Last week, veteran Frankfort reporter Ronnie Ellis described a cloud hanging over our state capitol and, just a few months ago, one of our U.S. Senators was brutally attacked while working in his yard. This holiday season, I hope that all Kentuckians can put aside our disagreements in order to celebrate and enjoy Christmas. Even though it can sometimes feel like we are on opposite sides, there are some events that can put life into perspective and make our disagreements seem small. 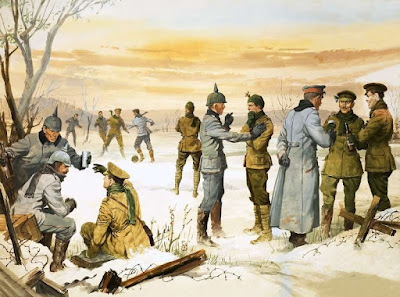 As the soldiers who have participated in the Christmas Truce came to realize, the joy and spirit of Christmas can transcend even our biggest differences if we are willing to let it. The sales job to peddle the GOP tax plan as a good thing for the average Joe and Jane has already started. The simple truth: There is enough window dressing in the bill to distract us from the fact that it is a permanent tax cut for the wealthiest and corporations, and at best a short-term benefit for most American taxpayers. Economists largely agree that the impact of this “reform” will increase the deficit to a staggering extent that could lead to another financial disaster for the American economy. After all their complaining about budget deficits, the GOP plays a dangerous game not to be confused with governing. We can consider this deficit as a loan to be repaid by our children and grandchildren, stealing the last vestiges of the American dream. Don’t be fooled. This is another #goptaxscam. Newport on the Levee is about to get a new destination for a family friendly day out with the opening of Jonbob Willis’ concept, Dart Rush. You may know Jon, who lives in Fort Thomas, as the photographer behind the Simple Portrait Project. While the link between Nerf battles and portrait photography may not be apparent right away, it’s definitely there: family. As the Christmas weekend approaches, many find themselves readying their Christmas Eve meals; bringing the holiday ham, decorating the cookies, and whisking the eggnog. However, for far too many local families, including many in Fort Thomas, such a feast is out of the question; in fact, for many Northern Kentucky children, breaks from school may mean the one meal they could count on, free/reduced lunch, is no longer being served. Elise Carter, HMS and HHS Business teacher now in her sixth year in the district, decided to do something about this problem. Carter teaches accounting, digital literacy, personal finance, and is the faculty sponsor of the Future Business Leaders of America (FBLA). 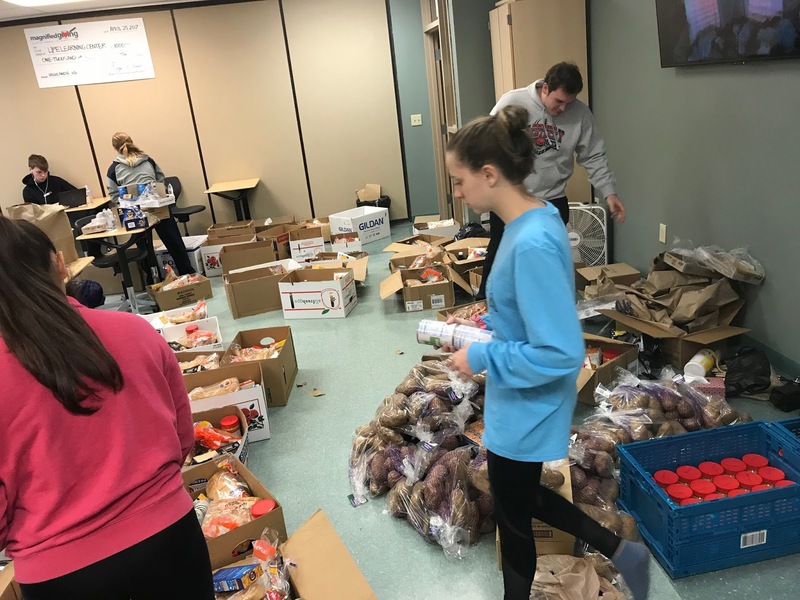 Last year at an FBLA conference she attended along with Zuri Carpenter, current Senior and FBLA President, Carter heard about a school on the eastside of Cincinnati that hosted Thanksgiving dinner at their school for families in their local community. To Carter’s surprise, the families in need were members of the same rather affluent school community that served the meal and were not homeless persons living in shelters. 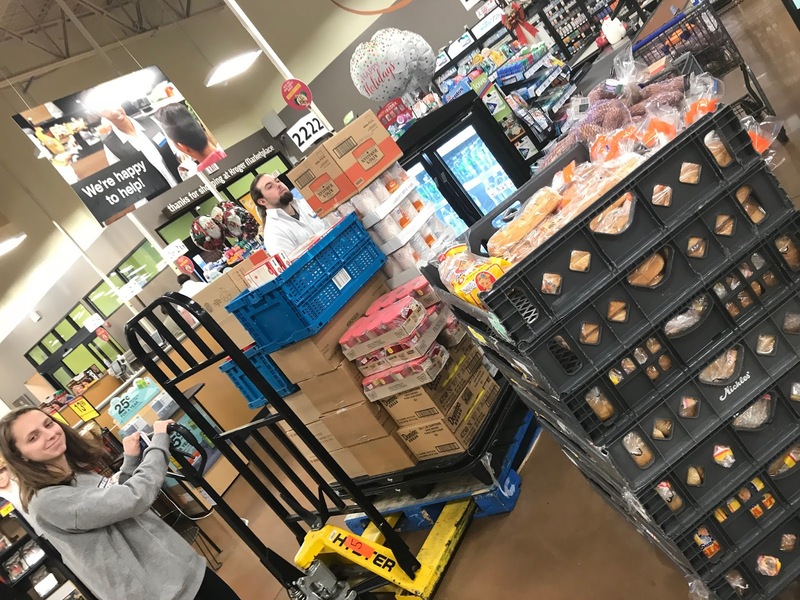 This inspired Carter to do something in her own community to meet the needs of those who may not be able to afford a holiday meal on their own. The Fort Thomas Independent Schools Central Office also helped to fund some of the food drive. 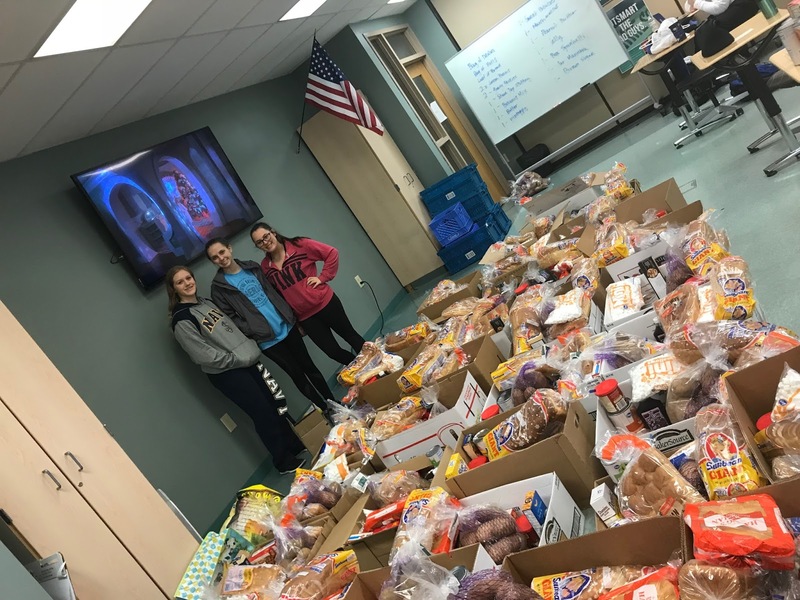 “We are proud of our students and teachers who continue to learn through servant leadership opportunities,” said Karen Cheser, Superintendent of Fort Thomas Independent Schools. “We have to be cognizant of the fact that we are preparing our students for the world and when our teachers step up like Mrs. Carter, that’s something we welcome in our district." In all, 50 boxes were collected by the FBLA from 27 different clubs at the school and 15-20 students helped to assemble the boxes. 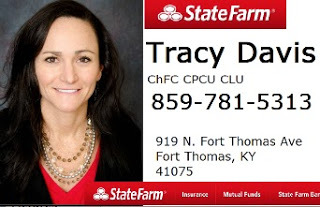 In order to identify families in need, Carter worked with the guidance counselors at Fort Thomas Independent Schools, Dayton Independent Schools, and with the Hosea House. The boxes will go to families who have the ability to prepare a meal at home but for whom the financial burden of a holiday meal would be too great. Thanks to the hard work, compassion, and gift of Carter, Carpenter, the FBLA and 26 other clubs at HHS, 50 local families will have a heartier Christmas; and that’s the true meaning of the season. PHOTO: Allen Ramsey, DWCPhoto.com. Highlands senior Drew Rom throws the ball in practice before the game at Great American Ballpark last year. The Highlands Bluebirds baseball team received a taste of life in the big leagues last year and will do it again this year. 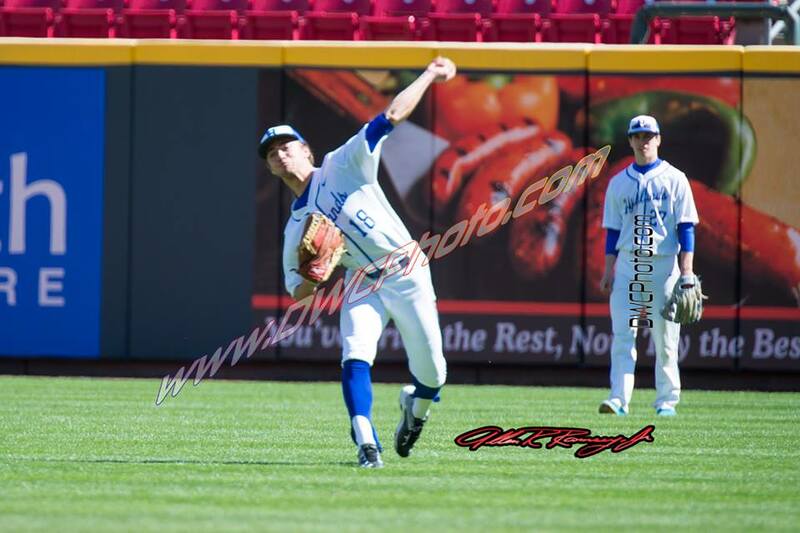 The Bluebirds will face 9th Region arch-rival Covington Catholic in one of the two games that Friday evening at Great American Ballpark in the Cincinnati Reds Futures Games. Highlands Head Coach Jeremy Baioni said the times have not been finalized. But start times of 5 p.m. and 7:30 p.m. are two potential times. "It's obviously a lot different feel playing in a facility like that when you're normally in the stands watching," Baioni said. "We want to make sure we go out and compete. It's still a moment these kids are going to remember the rest of their lives so we want to make sure we do our best to get kids in and out and let kids touch the field even if it's in a limited role really take the whole experience in and be a part of it. Let's face it. Very few of us are going to get an opportunity to do that again in the future." Call Matt Spencer today. 859-393-5264. Highlands lost to Cincinnati St. Xavier, 8-2 on April 8 on a sunny day at Great American. The Bluebirds later won their third straight 9th Region crown finishing 26-13 on the season before losing to eventual state champion Louisville Pleasure Ridge Park in the state quarterfinals. How Will the Net Neutrality Repeal Affect Greater Cincinnati Internet Customers? Last week, the Federal Communications Commission voted to discard net neutrality rules that prevented broadband providers from slowing sites or demanding payments from them for fast delivery. The decision opens the door for very different consumer experiences on the internet. The rules will go into effect in the coming weeks. In short, net neutrality is the principle that Internet service providers must treat all data on the Internet the same, and not discriminate or charge differently by user, content, website, platform, application, type of attached equipment, or method of communication. The repeal has left some wondering how local service providers would handle this. 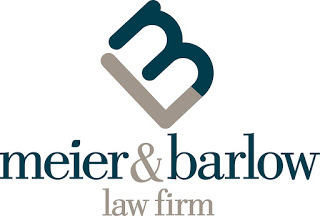 End of year estate planning? Call Ashley Barlow. 859-781-5777. This is an advertisement. With Cincinnati Bell and Spectrum controlling much of the market share in Greater Cincinnati, many questions were pointed to them. Spectrum is a brand of Charter Communications, formerly Time Warner Cable, which Charter Communications acquired in May 2016. They are headquartered in Connecticut, so a local statement on how the company would handle the repeal wasn't made available to the local public, however The Verge compiled a list of responses on the ten biggest ISP's responses. They said the statement has "no plans" to change its current policies, but would not give a firm commitment on future practices. Follow up emails to Spectrum went unanswered. Cincinnati Bell, on the other hand, responded directly to how they would handle the repeal. They are headquartered in downtown Cincinnati and have invested approximately a billion dollars in local fiber infrastructure in Greater Cincinnati neighborhoods. 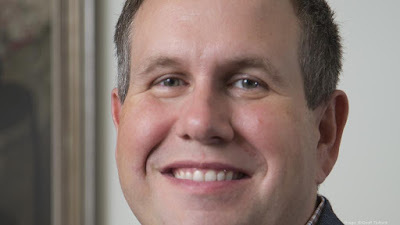 Chief Operating Officer, Tom Simpson, a northern Kentucky resident, laid out what changes current and future Cincinnati Bell customers would see. Tom Simpson. COO of Cincinnati Bell. In short: customers won't see any changes. "Since the FCC voted to repeal net neutrality rules, we have been asked repeatedly how this will impact our customers," Simpson said in a social media post. "We want everyone to be clear on our position."